How to Use It Best? The Bissell Pet Hair Eraser Handheld Vacuum, Corded, 33A1 is a handheld vacuum brought to you buy Bissell. Bissell has always made a name for itself, being among the leaders in the production of vacuums and leading the technological advances in the field. They are especially known for their ability to bring customers only the best quality of vacuums at an unbelievable price. The Bissell Pet Hair Eraser Handheld Vacuum, Corded, 33A1 is no exception to this. Handheld vacuums are popular because they are versatile and easy to use in tight locations or easy to pull out to just clean up small messes. Handheld options are incredibly useful especially for locations like the stairs or on the couches or other upholstery. That means that the handheld should be convenient to use and be very portable. The Bissell Pet Hair Eraser Handheld Vacuum, Corded, 33A1 meets these requirements, offering you an affordable handheld option. This vacuum comes with a 1 year limited warranty. It has a dirty container that has a multi-layer filtration system. The easy to grip handle allows for easy access to the on/off switch and cord wrap. There is an interchangeable hard nozzle and flexible rubber contour nozzle. It is lightweight and easy to carry around with you. There are quite a few pros to this vacuum. One of the biggest pros is the price of this machine. It is a really affordable item for almost anyone to get. Another positive is that this may be a small little machine, but do not let the size fool you. This is one very powerful machine. The attachment nozzles are incredibly easy to change out. It is really easy to empty the vacuum out when you are done using it. While it is corded, the cord is very long. Even though it has a very long cord, it can still run into problems if you need to get an area that is difficult to reach when you have no area around to plug it in. Another con is that it has a long curved handle, which could hinder its ability to easily get into certain locations especially underneath cabinets. This curved handle also makes it very awkward to hold as you can hold it in a certain place and it tilts forward due to its weight distribution. The tools may not be as useful when picking up items, and may not be worthwhile to use. Bissell is known for making powerful vacuum cleaning systems and takes pride in their quality of work. Bissell has been doing this for a long time and has been successful at it. Not only do they provide customers with powerful vacuums, they provide customers with vacuums at a significantly lower price. People are looking for bargains today, but they are also looking for quality along with that bargain. Lucky for users, the Bissell Pet Hair Eraser Handheld Vacuum, Corded, 33A1 exists. If you need to get up pet hair or small messes quickly, this is perfect for you. It can get the most stubborn of pet hair off of any surface. This is also a great piece of equipment to use when you need to clean your car. This vacuum also dumps out easily, and even allows the user to clean out the debris catcher to help ensure a thorough clean. Overall, this is an incredibly easy-to-use and rather powerful machine that would be a great addition to anyone’s home, especially if you have pets and a budget. The biggest disadvantage is the cord. While it is a 16 foot cord, it is still a cord and may have limitations as to where it can be used. This means that this may not be the most portable option, especially if you need to get to a place that does not have an outlet nearby. This may hurt how convenient this item is to use. Another disadvantage is the flaw in the design that makes it awkward to hold when using this item. 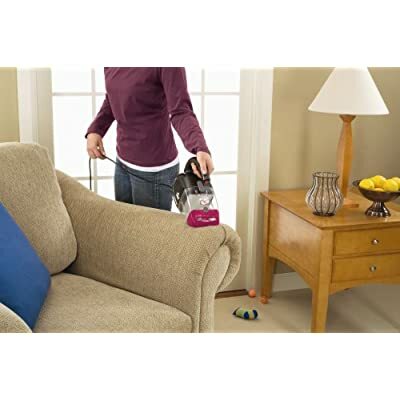 The Bissell Pet Hair Eraser Handheld Vacuum, Corded, 33A1 is best used for smaller messes, including small spills that need to be picked up or pet hair. It can be used on hardwood flood, other bare-floor surfaces, carpet, and upholstery. This is a perfect vacuum cleaners for animal hair with a pretty unbeatable price. 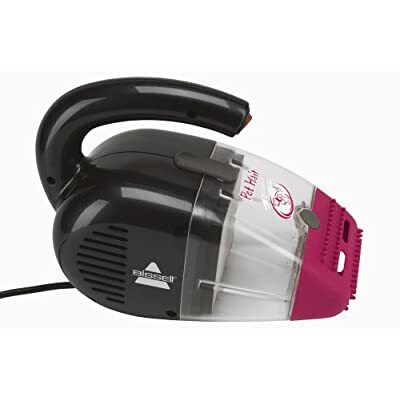 The Bissell Pet Hair Eraser Handheld Vacuum, Corded, 33A1 has a lot of power for a small and lightweight vacuum. It can clean messes quickly and is easy to clean out after it has been used. If you do not mind a corded handheld and want a good price, this is the perfect option for you.